In The year 1928, the Namdhari School of Music in Bhaini Sahib resounded for the first time with the musical notes "Sa Re Ga Ma Pa Dha Ni Sa". This was the result of a great endeavour by Satguru Partap Singh Ji. He knew that music is the food for the Almighty God and the human soul and how in the company of Satguru Nanak Dev Ji, Bhai Mardana's rabab attuned the Guru's soul to the Infinite by sounding the note of "Sat Kartar". Satguru Ram Singh Ji re-established Satguru Nanak Dev Ji's spiritual kingdom. In his presence, Asa Di Var was sung every morning and every religious gathering in the evening also started with devotional music by skilled singers. Satguru Ji undertook a painstaking search for skilled musicians and rababis, in order to preserve and hand over to the posterity the centuries-old traditional compositions in their original form. It was the first attempt to preserve the traditional melodies, rhythms, vocal traditions, and musical renderings of the hymns. In addition to making his contribution towards the spiritual, political and social regeneration of the nation, he took his responsibility towards music very seriously. The work he started was carried on by Satguru Hari Singh Ji. We concentrate here on Satguru Partap Singh Ji's times. First of all, he himself leamt the discipline of music and to play the dilruba from Bhai Mastan Singh, disciple of Bhai Gajja Singh of Patiala. In his young days, his main interests were studying and reciting Gurbani and attaining physical fitness. Then came his desire to leam and gain insight into the Indian classical music. The result of his love for music was that he started getting his sons educated in music from their tender years. Satguru Jagjit Singh Ji says that his musical education started at the age of four years and six months This means that he started playing the notes in the second half of the year 1925. His first teacher was Bhai Harnam Singh of Chawinda, district Amritsar. Bhai Harnam Singh was the star musician of the Namdhari divans (spiritual gatherings) for a considerable period, particularly in his young days. This inspiring artist with a medium height and white complexion gave a new direction to vocal music based on folk melodies. But Satguru Ji later on turned away from folk music and started preferring classical music. So he handed over his children's musical education in traditional Shabad singing to the musicians of the eastern Rababi school - Bhai Dittu, Bhai Kirpal Singh, Bhai Kalu, Bhai Lai. Bhai Taba, Bhai Nasir and others, and thus he perpetuated the classical tradition. Ustad Bhai Harnam Singh Chawinda was the first music teacher who lived in Shri Bhaini Sahib continuously for 25 years and thus devoted the best part of his life to the teaching of the art of music to the children there. His conduct and life style were highly artistic, but regulated by strict discipline. With early morning bath and starting his day with a recitation of God's name were the strict principles of his life. His life was all music, and strict regularity and discipline were its keynotes. While living in Bhaini Sahib, I got an opportunity to serve him and to leam from him. At that time, he appeared to be about 50 years old. His first residence was in a cottage near the present day crematorium of Bhaini Sahib. He walked from here to the school to teach music from 4 a.m. to 6 a.m. in winter and from 3 a.m. to 5 a.m. in summer. The room where Satguru's children and other children were given music lessons was in the north-western comer of the red-brick building near Ramsar. In order to enable children sing rhythmically at the correct tempo, Satguru Partap Singh Ji got a "tempo machine" prepared by Ganda Singh, a carpenter and later on a Suba This machine produced ticking sounds of the rhythmic beats of "teen taal", "chaar taal", "dhamar" etc. The sounds of the "taali" and the "khaali" beats were clearly distinguishable. Bhai Harnam Singh's hard work, initiative and pedagogical skills inculcated certain qualities in his students - absolute clarity, discipline, soft speech and other artistic qualities. There were two classes of students according to their age. Satguru Jagjit Singh Ji was in one of them, and Maharaj Bir Singh Ji was in the other. Meticulous attention was paid to the correctness of the note and the correctness of pronunciation. Around 1932, two other music Ustads (teachers) joined the school. They were the veteran musician Ustad Udho Khan and his son Ustad Rahim Bakhsh. They were from Rampur, a village in the south-east of Bhaini Sahib. They were artists belonging to the Talwandi school of music. They taught us Chhota Khayal, Vadda Khayal, Dhrupad and Dhamar. These Muslim artists got the same respect as Bhai Harnam Singh did. Since Satguru Partap Singh Ji was a great connoisseur of music, especially of classical music, he wished that the students of the school of music should not pay attention to anything else But Ustad Harnam Singh always wished his students to attend and participate in musical concerts and festivals and alter competitions so that they could assess their strength and develop a competitive spirit. 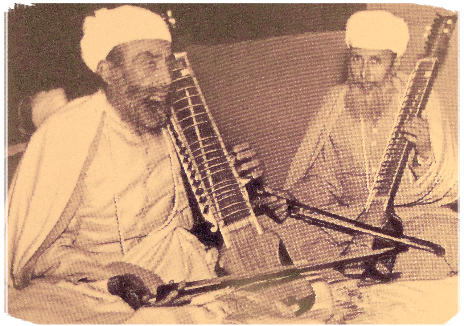 The music School of Bhaini Sahib owes its modem unique status to the hard work, dedication and teaching of Ustad Harnam Singh, Ustad Udho Khan and Ustad Rahim Bakhsh. Now under the patronage of Satguru Jagjit Singh Ji, the students of this school have made a world wide impact in the field of of gurmat sangeet.